I like positive people. Really, I do. I love how they push me to see the silver lining and keep me from slipping into the depths of despair. I love their smiley faces and perky steps. I love their eyebrows, simultaneously raised while nodding me on as I talk. I love them. I admire them. Sometimes I am one of them. I really love positive people who listen, who are WITH me, first. I sometimes get phone calls from people asking me if I do “grief counseling”. Because I know that too much talking is rarely a good thing when someone is asking that question (or any question? ), I refrain from responding with another question: “What do you mean when you say ‘grief counseling’?” I simply reply: “Yes”. What I want to say, what I hope I get to say at some point, is that when it comes down to it most pain, most of LIFE, involves some sort of loss and all loss requires response, namely grief. If your parents divorced at 2 or at 22, the family you knew has died. If your spouse has an affair, the relationship you thought you had has died. If you were abused as a child, emotional and physical safety was taken from you. If your child moves across the country, you feel like part of your heart has left with them. Even good things bring loss and grief. When you have a baby you loose so many things: freedom, sleep, money, time… Even marriage results in the loss of your single life and perhaps your home. Transition, loss, grief…they are a daily part of life. So, yes, I do “grief counseling”. We are all grieving. We like the “be happy with those who are happy part.” We can even fake it and do this part well. We struggle with the other part. We hit the road. Check out. Find something else to do. People are afraid of grief. Like birth, it can be messy and overwhelming…difficult to predict and manage. It does not always respond to programs or effort. In fact, the more energy you exert, the more stubborn it can become. Grief needs space, time, and room to breath. Things break in birth…like your former identity and your water. Of course, there are the gifts, too…joy and newness, but the less recognized gift is loss. Joy and loss are part of every change, every loss, every birth. Grief requires, sometimes demands attention in often unpredictable and inconvenient ways. You might expect the familiar feelings of sadness on Father’s day after your daddy dies, but you are surprised and even a little resentful when this old companion, heartache, is still showing up after twenty years. I should be over this! We have a difficult time with our own grief, but often even a harder time with the grief of others. Ten years after the divorce, you would think my kids would be over it by now! Why do they keep bringing it up? Wow, she still seems to be struggling with what he did. I wish she could just let it go. We forget or fail to realize that at every life event, every marriage, every birthday, every graduation, grief must be dealt with again, even if on a smaller scale. The scared, hurt, angry pain must be given room to cry out, room to breathe, room to be seen, room to be heard. Satisfied, it settles down…when it is seen and heard. Like a child, if ignored, it will only get louder. We don’t realize that part sometimes. We hope that if we just ignore the pain, intellectualize it, explain it with smart words or ideas, or worse…change the subject, just pretend that our friend isn’t sad, believe that they should be better…then the messy grieving will just go away. Or, we think that if I bring it up it will just get worse. Maybe, just maybe, if I just hold my breath…it, the grief, the pain… will just float away. We actually come to believe that all of our ignoring, explaining, pretending is such a favor to our friend. We are helping them “move on”. We are making it easier on them. Here’s the hard, hard, hard truth: So very much good can come out of grief. The darkness scares us and we want to push someone out of this hard, hard, hard place. But, when we do that we are stealing. We are thieves. 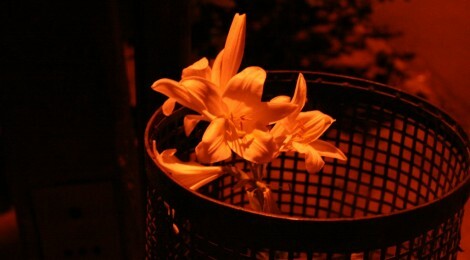 We are stealing an opportunity…an opportunity for this grief, this garbage, to turn into compost in our friend’s life. We push them out, with all of our talking, with all of our fixing, with all of our perky eyebrow raising, with all of our martyred helping, all of our smart explaining and subject changing. We push them out and the grief, the garbage, never has time to sit, to settle, to rot, to breath…to turn into compost…fertile ground for the new identity, the birthing that MUST take place. So we fix and talk and push for our friend forgetting or never realizing that it is their own pushing and their own screaming that helps them birth the new person that they can, that they will, that they MUST be after this loss, this change that they may have never asked for. I was pregnant with my first child when Jon and I were sitting with our close friend, Johnny, in California. The father of three girls, he was reminiscing about their births and things that he had learned: “Did you know that there is this period of time when the mother wants to push so badly but to push would put her and the baby in physical danger? It is called transition.” A pusher by personality, I will never forget that moment. Sometimes God calls us to be still…to stop pushing. He invites us to be still and sit with the pain of the transition. He knows that pushing…whatever that looks like for you, for me…is dangerous…to who we are and who are going to become. Our culture likes to push. Out of our discomfort, out of our lack of tolerance for pain, we push through transition and loss. We even use various epidurals to ease the pain of the pushing while we are at it. We fix and talk and push. We work and drink and eat and numb out at the computer. We are in such a hurry. We forget or never realize the value in sitting with pain. Before we fix and talk and push, before we raise our eyebrows and smile and nod people on, we might need to sit. Like a mirror, we might need to reflect. Wow, you seem to be really sad. Yes, it is stating the obvious. It is telling it how you see it. And, in the seeing and hearing and quiet sitting…in reflecting the pain and darkness we are so afraid of in our loved one’s face, the gifts of loss can be experienced, can be given room to breath. The garbage, the smelly, messy stuff of grief, can become compost. And, maybe, as we learn to tolerate the smells and sights and sounds of grief, as we learn to make room for the pain and darkness and messy transition in the lives of our loved ones, we will learn to make room for it in our own lives as well. We might be surprised what is birthed when we learn to sit, learn to tolerate, learn to make room for pain…for grief and garbage. Emily you have really outdone yourself this time. I can and will take this to heart. Maybe I can refect on it and turn my garbage into compost. So true…great post…much to think about. May I have your permission to direct people to this post? It just speaks volumes! Absolutely, Rebecca. Thank you for reading, for your feedback, and for sharing it with others! My friend is dealing with the loss of her mother and post partum depression, thank you for helping me to help her! I will listen more and just acknowledge her feelings more. This was such a powerful post. Heather, thank you for stopping by to read and I am so thankful and glad to know that it was a help to you. “Sometimes God calls us to be still…to stop pushing.” Emily, this is so profound! I needed to hear this today, it has confirmed what I was feeling where God has me and my family right now… Thank you for being obedient to His Spirit in speaking it. Emily, was looking through the archives and had never read this one. The title grabbed me, especially with the year that we’ve had. It touched me! Thank you for responding to what the Lord has called you to, to what He has put in your heart. I love watching and hearing as you grow and your family grows. It’s helping me grow too! Love to all! Lisa, I got your comment on my blog. I wanted to let you know that your encouragement came at a good time for me. It really meant a lot. Thank you for you and Johnny always being such positive, encouraging voices in our lives and such examples to us.